BACKGROUND AND PURPOSE: Preoperative localization of the artery of Adamkiewicz (AKA) may be useful in selected children in prevention of ischemic spinal complications of spinal or thoracoabdominal aortic surgery. The aim of our study was to investigate the ability of 64-section CT for assessing the AKA in children. MATERIALS AND METHODS: Forty children (mean age, 7.5 ± 5 years) underwent thoracic imaging with a 64-section CT scanner after intravenous injection of 1.5 mL/kg of contrast agent. Volumetric reconstructions were obtained for every patient. Identification of the AKA was performed on the basis of continuity from the aorta to the anterior spinal artery with a characteristic hairpin turn. Identification of the AKA and determination of its origin and course were analyzed by 2 independent radiologists. RESULTS: The AKA was successfully visualized in 38 patients (95%). Twenty-seven (71.1%) AKAs originated on the left side, whereas 11 (28.9%) originated on the right side. It was seen to originate at the level of the left 5th intercostal artery in 1 patient, the left 8th in 4, the left 9th in 15, the left 10th in 5, the left 11th in 2, the right 8th in 2, the right 9th in 6, the right 10th in 2, and the right 12th in 1. CONCLUSION: Sixty-four-section CT angiography depicted the AKA in a very high percentage (95%) of children. The results of this study suggest that 64-section CT angiography is a viable noninvasive technique that could be an alternate to selective angiography for delineating the AKA. Accurate localization of the artery of Adamkiewicz (AKA) is desirable when planning surgical treatment in selected children presenting with various diseases such as spinal lesions and thoracoabdominal aneurysms. 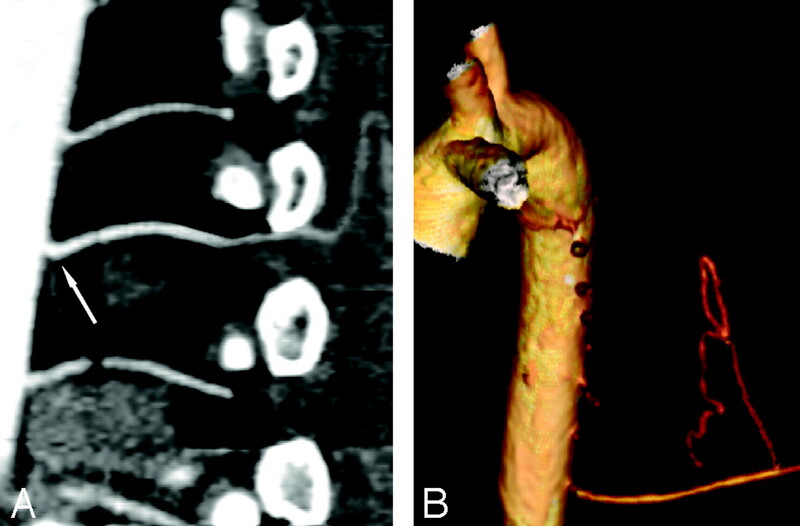 Preoperative assessment of this artery may help reduce the risk of postoperative ischemic spinal injury or paraplegia.1 Selective angiography, although invasive, time-consuming, and potentially harmful, is the reference standard for visualizing the AKA.2 Noninvasive detection of the AKA with CT angiography by using a 4-section CT scanner has been reported in adults. In these reports, the detection rate was not satisfactory because it never exceeded 90%.3–5 To our knowledge, no previous study has evaluated the ability of CT for assessing the AKA in children. The purpose of our study was to assess the ability of 64-section CT angiography to depict the AKA in children. The study included 40 consecutive patients (23 male and 17 female; mean age, 7.5 ± 5 years; age median, 7 years; age range, 5–14 years) who underwent cardiac and/or thoracic CT between June and September 2005. Twenty-five of these patients had undergone an arterial switch operation for transposition of the great arteries in the neonatal period, 10 had mild coarctation, and 5 had kinking of the thoracic aorta. All patients were clinically well without any medication. Our institutional review board did not require its approval for this study. Informed written consent was obtained from all patients’ parents or guardians before patients underwent cardiac or thoracic CT examination. All CT scans were obtained with a 64-section CT scanner with a 0.35- to 0.4-second rotation time (LightSpeed VCT, GE Healthcare, Milwaukee, Wis). Scanning parameters were as follows: x-ray tube potential, 80–100 kV; section thickness, 0.625 mm; and effective pitch, 0.984. All CT scans were obtained by using an implemented fully automated real-time anatomy-based dose regulation, modulating the effective tube current from 100 to 200 mA. The overall scanning time was shorter than 4 seconds (median, 3.2 seconds; range, 3–3.9 seconds). Patients were requested to hold their breath during scanning. When patients could not hold their breath for the entire scanning time, they were instructed to breathe shallowly after holding their breath for as long as possible. A 22-gauge plastic intravenous catheter was placed in an antecubital vein in the right or left arm. The line was then connected to a power injector. A total of 1.5 mL/kg of body weight of contrast material containing 300 mg of iodine per milliliter (Omnipaque; GE Healthcare) was administered at a flow rate of 2.5–3 mL/s. The scanning delay was set by means of an implemented triggering system. Under these conditions, continuous low-dose fluoroscopy (70 kV, 20 mA) at the level of the ascending aorta was initiated 6 seconds after the start of the injection of the contrast. A circular region of interest in the ascending aorta was measured every second. As previously described,5 when the attenuation value reached a preset threshold (an absolute attenuation value of 85 HU) in 2 consecutive sampling points, scanning began. CT imaging started 2 cm above the pulmonary artery bifurcation and stopped at the lower edge of the liver (location was determined on a scout digital radiograph).5 The triggering system was used to perform acquisition during the pure arterial phase. The criteria for identifying the arterial phase during the acquisition were based on the differential enhancement of both ventricles, with a higher enhancement of the left ventricle compared with the right ventricle. Images were transferred to a workstation (Advantage Windows 4.2, GE Healthcare). We used multiplanar reconstruction (MPR) images, including oblique coronal images and maximum intensity projection (MIP) images. We also used a cine-mode display, in which original transverse sections and MPR images can be analyzed by scrolling the images on the workstation as if the pages were being turned over. The AKA was identified as an enhanced vessel oriented toward the anterior spinal cord and joining the anterior spinal artery at the tip of a typical hairpin turn (Fig 1A).3–5 The origin and course of the AKA were evaluated by 2 independent radiologists (P.O. and P.S.). A, Oblique coronal reconstruction allowing identification of the AKA as it makes the characteristic hairpin formation at its union with the anterior spinal artery. Note the continuity of the posterior branch of the intercostal artery and the AKA (arrows). B, Transverse image showing 2 contiguous enhanced spots (arrows) in the ventral surface of the cord, corresponding to the AKA and the anterior spinal artery. C, MIP axial reformatted image showing the continuity of the aorta, the intercostal artery, its posterior branch (arrow), and the AKA. Analyses of cine-mode display and postprocessing of images took less than 8 minutes (median, 7 minutes; range, 5–8 minutes) on the workstation. CT was performed without complication in all patients and during the pure arterial phase in 38 patients. In the 2 other patients, CT acquisition was premature because images were acquired when enhancement was maximal in the right ventricle. The AKA was successfully visualized in the 38 patients (95%) in whom images were acquired during the arterial phase. In this phase, the AKA constantly presented with its characteristic hairpin turn within the bony spinal canal. In these 38 patients, the course of the AKA from the intervertebral foramen to the anterior spinal artery was traceable on continuous transverse images and/or on multiple oblique coronal MPR and MIP images (Fig 1). It was also possible to trace the continuity between the aorta, the intercostal artery, or lumbar artery and the AKA without significant artifacts caused by proximity to bone (Figs 1 and 2). In the 2 patients in whom images were acquired prematurely during the pulmonary arterial phase, the AKA was not identified. A, Curved planar reformatted image clearly delineates the continuity of the aorta, the intercostal artery (arrow), and its posterior branch, the AKA, and the anterior spinal artery. B, Note on the volume-rendered image, the characteristic hairpin curve formation of the union of the AKA and the anterior spinal artery. Twenty-seven (71.1%) AKAs originated on the left side, whereas 11 (28.9%) originated on the right side. It was seen to originate at the level of the left 5th intercostal artery in 1 patient, the left 8th intercostal artery in 4, the left 9th intercostal artery in 15, the left 10th intercostal artery in 5, the left 11th intercostal artery in 2, the right 8th intercostal artery in 2, the right 9th intercostal artery in 6, the right 10th intercostal artery in 2, and the right 12th intercostal artery in 1. The concordance of interpretation between the 2 radiologists with regard to the identification of the AKA and its level of origin in the 38 patients was 100%. To our knowledge, no previous study has evaluated the ability of CT angiography to assess the AKA in pediatric patients. In this first study, we have shown that the 64-section CT angiography can easily delineate the AKA with a simple scanning protocol and rapid postprocessing analyses. Identification of the AKA may be important in planning surgical treatment and/or interventional radiologic procedures to prevent the risk of ischemic spinal complications or paraplegia.1 This preoperative information is of importance because different techniques have been shown efficient in preventing spinal ischemia, including drainage of CSF from the spinal cord,6 motor-evoked potential of the spinal cord,7 spinal somatosensory-evoked potential,8 and hypothermic bypass.9 Although preoperative selective spinal angiography is the reference standard, complications from this procedure are well known and have a relatively high incidence.2,5,10 Indeed, selective spinal angiography may expose the patient to the risk of retroperitoneal bleeding, temporary cerebral ischemia, and transient paresis of the lower extremities from spinal ischemia in up to 4.6% of patients.2 Furthermore, localizing the origin of the AKA with selective spinal angiography is time-consuming and may be hazardous, with a low success rate between 55%–75%.11,12 These difficulties are related to the unusual anatomic presentations of the artery, in particular its various branching levels, as have been shown in previous anatomic studies13,14 and in our present study. Alternative diagnostic tools for assessment of the AKA include noninvasive techniques with CT and MR imaging. Multisection CT has been performed with a 4-section CT scanner in adults. However, the sensitivity of detection of the AKA was quite poor because the success rate for visualizing the artery ranged from only 68% to 90% and localization of the origin was worse.3,5 To become a clinically accepted tool, CT angiography of the AKA must accurately visualize the origin and course of the artery. Interestingly, our study demonstrated that 64-section CT angiography can depict the AKA in a very high percentage (95%) of children. The improved spatial and temporal resolution of the new generation of scanners increases image quality, thus facilitating assessment of small-caliber arteries. Furthermore, the image quality, aided by advanced interactive and high-speed postprocessing applications, was so good that concordance of interpretation between 2 independent radiologists with regard to the origin and course of the AKA was excellent. The artery was easily identified as it made a characteristic hairpin turn with the anterior spinal artery on the oblique coronal view. In successive axial images, both the AKA and the anterior spinal artery were recognized as 2 contiguous enhanced spots in the ventral surface of the cord (Fig 1B). It was possible to trace the course of both vessels, thus showing a characteristic relationship in which they classically neared each other as they approached their junction in an inferior-to-superior orientation. As previously reported,3–5 postprocessing such as volume rendering and curved planar reformatting was possible for tracing the continuity of the entire system, starting from the aorta, proceeding to the intercostal or lumbar artery, the AKA, and finally the anterior spinal artery (Fig 2). This reconstruction was not systematically performed because it is time-consuming and does not influence the accuracy of the diagnosis. In our routine practice, rapid and accurate diagnostic investigation of the AKA was performed on axial source images, oblique coronal images, and MIP images. The timing of the scanning relative to the injection of contrast material is an important parameter in the successful visualization of the AKA. Optimal scanning timing within the pure arterial phase is mandatory to extract the artery without significant spinal vein contamination. The criteria for identifying the arterial phase were based on the differential enhancement of both ventricles, with a maximal enhancement of the left ventricle compared with the right ventricle. This condition is achieved not only with the high temporal resolution of the 64-section CT scanner but also with the triggering system that was used in every patient. In our study, acquisition during the arterial phase was obtained in the 38 patients in whom identification of the AKA was possible. In the 2 others, acquisition was relatively premature because enhancement was maximal in the right ventricle. Under these conditions, examination of systemic vessels is theoretically impossible. MR imaging is another potential alternative noninvasive technique for assessing the AKA. However, diagnostic accuracy varies substantially according to the different studies in adult populations, with a low rate of detection that ranged from 69% to 84%.15–17 According to these reports, MR angiography of the AKA is time-consuming and requires an experienced radiologist to track small vessels.16 Furthermore, this technique is currently handicapped by a complicated protocol, low spatial resolution, and long scanning time compared with CT angiography.17 These may limit routine clinical application of this technique. New techniques improving MR imaging are being developed, such as higher magnetic field strength, new coils, contrast agents, and acquisition methodology. These technical parameters must continue to improve for MR imaging to be considered as a noninvasive, non-x-ray technique that offers an alternative to the new generation of CT scanners for the detection of the AKA. We acknowledge the following limitations of the present study: First, there was no standard reference to confirm that we had, indeed, identified the AKA. For ethical and also practical reasons, we did not compare 64-section CT findings to selective spinal angiography. Indeed, there is now a large body of literature that verifies the characteristic appearance of the AKA, which presents with a typical hairpin turn aspect that is easily identified on CT angiography.3–5 Second, the radiation dose is a real problem in our pediatric patients. However, as done previously in other institutions, we systematically use an implemented fully automated real-time anatomy-based dose regulation, modulating the effective tube current, allowing a reduction of up to 40% of the radiation dose.18 We also apply individual adaptation according to the patient’s morphology. Because of these adaptations, the radiation doses used are 4–7 mSv, in the same range as those in pediatric cardiac catheterization with prolonged use of fluoroscopy.19 Third, we acknowledge that although CT angiography may be useful to identify the AKA preoperatively in adults before thoracic aortic stent-grafting or aneurysmal repair, it is more rarely imperative in children. However, our study may have clinical implications in dedicated pediatric hospitals such as our institution. In our practice, we may need CT angiography of the AKA preoperatively in some very selected situations, such as pial spinal cord arteriovenous malformations, aneurysms of the descending or thoracoabdominal aorta encountered in severe forms of Marfan disease, Takayasu arteritis, or other chronic inflammatory diseases involving the aorta. Sixty-four-section CT angiography depicted the AKA in a very high percentage (95%) of children. The results of this study suggest that 64-section CT angiography is a viable noninvasive technique that could be an alternate to selective angiography for delineating the AKA. Accepted after revision March 31, 2006.